Some of the faculty members who work with me this week got into that tired argument again over whether the plural of syllabus is correctly “syllabuses” or “syllabi.” (I think I’d said “syllabuses” out loud in a conversation earlier, and just a few minutes after others had overheard this phrase of mine their argument was full blown.) I don’t really want to continue the debate here. But wouldn’t we like to see some of what’s behind the English word, these English words? How Greek and how Latin? How fake and how real? How right our uses of them and how wrong? How educated and how pretentious? How novel and how historical? The plural of syllabus is syllabi. Or is it syllabuses? Focuses and foci, cactuses and cacti, funguses and fungi: English has a good set of these Greek and Latin words—and pseudo-Greek and Latin words—that might take a classical-sounding plural. Or might not. It kind of depends. There’s pretension, no doubt, in using fancy plurals: a hangover from the days when class distinction could be measured by the remnants of a classical education. But we’ve all been carefully trained to mock such pretensions (on the grounds, as near as I can tell, that it’s terribly lower class to affect the traits of the upper class). And the most prominent use of such plurals nowadays is for comic effect, puncturing a stuffy occasion. So the debate has never been about whether there are or should be any rules of usage, or even about whether linguists should help people to figure out what those rules are, relative to a given context or style of speech or writing. The contested question is what credence to give to the “rules” that self-appointed experts attempt to impose on the rest of us, especially in cases where these “rules” are inconsistent with the practice of elite writers, and are justified by illogical appeals to logic, historically false appeals to history, or unsupported assertions about ambiguity and other aspects of readers’ uptake. Is the “will of custom” sometimes equivocal? Of course; the mansion of the English language has many rooms. Is it appropriate to limit this variation by imposing a “house style” on particular publications? Sure, if you want to. Will terrible things happen if your favorite style guide fails to constrain some optional choice, like “syllabuses” vs. “syllabi”? Surely not. The question we must quickly ask is whether Taylor calling a syllabus a collection in 1667 was a mistake, the appropriation of a fake and graecized Latin word, a misinterpretation, a spurious deduction? Was he using bad English way back then? Why then does the OED editor choose to include that now? Am I asking too many questions? Let’s take a look at other dictionary makers’ look at the Greek word allegedly causing all of the confusion. Click here for the full entry on συλλαμβάνω and collection of uses by Henry George Liddell and Robert Scott. The old verb in Greek is not too far off from the newer English noun syllabus, is it? “The syllabus, including [collected] links to lecture notes and homework assignments, can be found here,” writes Dr. Liberman and his co-instructor here. These are translational uses of the old Greek forms. They are generative. They are not easily contained or collected by our expert opinions about which is fake and what must be true. It’s the first recorded “conception,” the conceiving of the first human being by his mother. My rambling post went on long enough. So in this comment I want to add a few things about the Greek variants of συλλαμβάνω being ambiguous. of females, conceive, Arist.HA582a19, GA727b8, Sor.1.28, etc. ; “ἐν γαστρί” Hp.Aph.5.46; “ξυλλαβοῦσα τὴν γονήν” Id.Steril.220; of the womb, “ς. τὸ σπέρμα” Arist.HA583b29, al., cf. Luc.VH1.22: but συνειληφυῖα τοῦ τεκεῖν near to be delivered, LXX 1 Ki.4.19. The LXX translator(s), I might add, did not have to use συλλαβοῦσα for the Hebrew verb וַתַּ֙הַר֙. In fact, for Hagar’s conceiving of Ishmael in 16:5 (הָרָ֔תָה), there is no συλλαμβάνω but only ἐν γαστρὶ. Hebrew seems, at least in the Bible, to be more consistent and to be less ambiguous for the phrase in question. Where else is it used differently, not for “conception” of a child in a woman’s womb? Now, when I use the Latinate English conception, I’m immediately using a phrase that is ambiguous and metaphorical. I can conceive of using this word in contexts that have nothing to do with mothers. So the Greek συλλαμβάνω is ambiguous. So is the Latin concipiō. But not so or at least less so the Hebrew הָרָה. What’s the big deal? Well, the ambiguities come from the metaphorical nature of the word. We might say “literally” that συλλαμβάνω and that concipiō both can mean to “take together, to collect together, to gather together” and to “take to oneself/absorb/conceive/imagine/understand.” These meanings, as an image, carry across other meanings to other contexts. (Jerome, for the Vulgate, for Genesis 4:1 and 16:5, had no trouble using this ambiguous Latin word for the less ambiguous Hebrew word. Likewise, he used the same ambiguous Latin word for the nearly equally ambiguous Greek word in Luke 1:31.) We should say again that neither the Latin nor the Greek only has to do with empregnation and gestation and conception of babies in some technical sense. When we use syllabus today things are much more technical. much less ambiguous, and so don’t we feel we need to get things right (and not wrong) about it and its plural (as if there must be only one plural form, and the right one)? An anecdotal statistic — I just now searched my e-mail archive back to 2004. The form “syllabi” shows up in 67 e-mail threads. The form “syllabuses” shows up exactly one — in this very BLT post (I have BLT posts automatically e-mailed to me.) So, among academics at least (I work as a professor) I suspect that “syllabi” is the more commonly used form; even though “syllabuses” would be theoretically more correct. Since the OED attempts to be a descriptive, not prescriptive, dictionary, the editors try to collect all major uses of words, with early exemplar uses (including historical uses). The editor must have been convinced that “syllabus” was sometimes used in English to mean “collection,” and that Taylor was an early example of this. The plural form octopodes reflects the Greek plural; compare octopod n. The more frequent plural form octopi arises from apprehension of the final -us of the word as the grammatical ending of Latin second declension nouns; this apprehension is also reflected in compounds in octop- : see e.g. octopean adj., octopic adj., octopine adj., etc. I think a more interesting fight is the struggle between “data” and “datum” — at least I never hear anyone say “datas.” But it is tricky. Consider the emerging form “big data” which can refer to the “big data” movement (singular). I do not think I have ever heard anyone say “big data are”; although constructions like “big data is” are quite common. 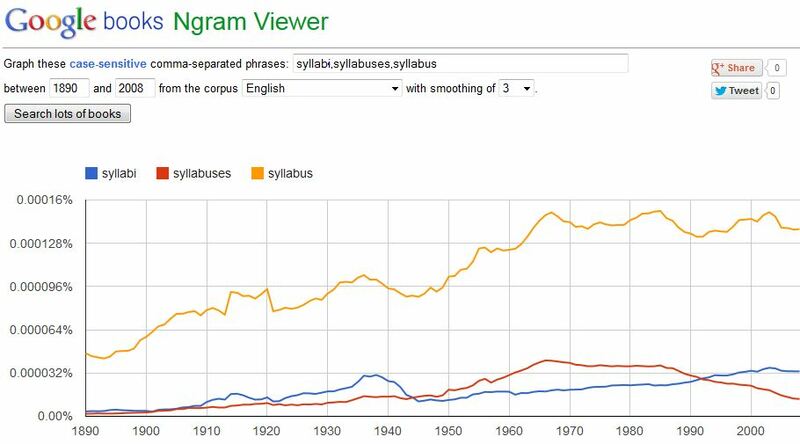 It is quite uncomfortable for me to say “syllabuses”: “ˈsɪləbəsɪz” — the combination of the stressed “ɪ” sound followed by two schwas followed by an unstressed “ɪ” is difficult for me — a tongue-twister. In Google Reader, for the subscriptions I have, there is exactly the same pattern as you find in your email when comparing “syllabi” and “syllabuses.” Only my post and the ones I refer to in my post have the latter; the vast majority of blog writers I read use the former. As for pronunciations, I have no difficulty saying “syllabuses” but I am conditioned to see at least raised eyebrows when I say it. I do agree with you about the ease in saying “octopuses” as “ˈɑktəpʊsɪz.” But do you find it easier to say “Jesuses” or “Jesi”? the “immaculate conception” is a doctrine of the Catholic Church that officially dates back to the mid-1800s and is about Mary’s conception, not that of Jesus. According to that teaching, by the work of God, *Mary* was conceived without the stain/macula of Original Sin (in order for Jesus not to inherit it in his flesh later). You are absolutely correct, and I believe that those in the Catholic Church who hold to the dogma of Mary’s immaculate conception must agree that the prophecy from the angel in Luke 1:31 (which I’ve quoted above) is subsequent to his announcement in Luke 1:28 (and perhaps in Luke 1:30b), from which the doctrine may be derived. My language was quick and sloppy. To slow it down and clean it up, please let me revise: “here’s the announcement [right after the announcement(s)] of the immaculate conception.” I suppose I could say more about this being also one of the announcements of the virginal conception, as if that would be less troublesome to blog about. I’m not sure that I can recall saying “Jesuses” — of course, it is a possible construction, but I’m not sure it is in my working vocabulary. The forme that constantly confuses me is genie/genii and jinni/jinn, because it seems that two different forms of singular/plural are almost opposite each other (because one form comes from the Latin, and the other form comes from Arabic). And our conversation here is somehow reminding me of “The Gospel of Jesus’s Wife: A New Coptic Gospel Papyrus” announced earlier in the year and of the “Octopus’s garden in the shade” still sung about since Ringo Starr invented it. That “Gospel of Jesus’s Wife” papyrus has completely dropped out of sight since the forgery allegations, hasn’t it? I thought at some point we were going to get some rigorous lab results. Those results are awfully slow in being announced. Karen L. King, who first brought forward that “Gospel of Jesus’s Wife” fragment, seems to be “On Leave / Spring term 2013” and is perhaps working on the testing (or leaving it until a bit later). Well, Kurk, everyone but the Catholics would disagree that the doctrine of the Immaculate Conception could be derived from those Lukan passages. “Favored one” does not necessarily mean that Mary is some other kind of human than the rest of us. If you have time, you might listen to Jeannie (Eugenia) Constantinou’s bible studies, “Search the Scriptures” podcast on Ancient Faith Radio. She has a multitude of letters after her name, and is a Greek-speaker. Recent interview with Keven Allen, also to be found at AFR, has a lot of discussion about the Orthodox view of canonicity of scripture, which might interest you. 🙂 I’ve already confessed to using language that was quick and sloppy. And now you want me to continue to clarify. Let me first say that I’m with you in a great deal of appreciation for the Septuagint – and yet your commitment to the LXX is far greater than mine. Quick question: do you have an LXX bound together with the NT as a single volume? Did you see our discussion around this related to a post here? I am very much grateful to you for your recommendation to me to learn more about the Orthodox view of the scripture and that canon, from Jeannie (Eugenia) Constantinou. So now to be clear: I’m not trying to recite doctrine of any particular group. I am interested in how – when it is read together with the Greek Genesis 4:1 – Luke 1:31 or perhaps a reader of it is able to make Mary into a “the second Eve” or “the last Eve.” This is not too different from what Paul – in 1 Corinthians 15:45 – makes Jesus into: “the second or last Adam” (with ὁ ἔσχατος Ἀδὰμ). I cannot really claim that Paul’s writings are clear either, however. Is this not clear: An immaculately conceived Mary conceiving as a virgin an immaculately conceived Jesus (with no sin imputed by the first Adam or the first Eve) are rather striking doctrines? The LXX and the NT read together, in some places, in some ways, seems to allow for the arguments. Do know – and I really should be clear – that I am interested in the literary and in the rhetoric in these texts. How authors and translators construct views and how readers and audiences are influenced by them is just fascinating – to me anyway. As mentioned, my post rambles and only comes to this common ambiguous Greek phrase referring to these two unique mothers as I’m trying to establish how sloppy certain dictionary makers and linguists reading them can be. The social-language, the rhetoric of this, is intriguing. Yes, that’s very clear! Might need a preface, something like, “If we take the Catholic view,…” -because Protestant’s won’t hear, even if they know the difference. The “immaculate conception” angle is indeed interesting, but isn’t necessary to make your point. I’m biased, it’s true, but I did spend the first 20 years of my life as a Catholic, and so know a few things from that angle. If you are truly interested in learning about EO, you could really do no better than to read the blog of Fr Stephen Freeman, http://www.glory2godforallthings.com. Yes, I get that you’re drawing forth the wordplay, and that’s very intriguing to me. Really fills out the *meaning* – which is, I think, what we’re after. Some of your observations make me smile… The reception history would indeed be a different thing for you, considering the ecclesiology that has been familiar to you. So finally, I do not know of a bound-together LXX and NT in English. Such a critter could probably be obtained in Greece, though, and of course it would be in Greek. However, this project, which I “mentioned” a while ago to Suzanne, is ongoing, and I’ll be very happy when it’s ready. The Old Testament (in progress) is based on the Greek text of the Old Testament (Septuagint / LXX) with all major Masoretic and Dead Sea Scroll variants documented in the footnotes. See Zephaniah (Sofonias) as a sample. For reasons documented in the comprehensive introductory section, the EOB also provides the Hebrew / Masoretic versions (WEB) of Job, Jeremiah and Esther. Hmm… I didn’t find Constantinou’s comments to be belittling; I’m sorry they struck you that way. Remember that interview was for a general audience. Any good Orthodox translator would definitely consult the MT, because what we’re after is meaning, and if the meaning is clearer in the MT – and consistent with O. interpretation otherwise – then the MT word/passage is what we should use. This is the opinion of Fr Tom Hopko, former Dean of St Vladimir’s Seminary, and I agree with him; I think Constantinou would too, if asked about it directly. She’s quite approachable, and answers her email. The thing is, EO doesn’t think of scripture as “authoritative” in the same way Protestants do (and neither does scripture stand *opposed to* Tradition, as with Catholics). That’s just not a category we use when we talk about scripture. Also, because of various influences and values, the Protestant Tradition 😉 sees each verse of the bible as being equal in value, or “weight.” In EO, all scripture is important, but some parts are more important that others. And all scripture text is to be interpreted through the lens of the Cross and Resurrection of Christ; that is where one stands, looking back at the OT and forward to the rest of the NT. This is counterintuitive to us westerners, who want to start at the beginning and proceed in systematic fashion to the end. Remember that Fr Stephen is writing from his vantage point (including growing up generic Baptist in the South, years as an Episcopal priest, undergrad study of biblical languages, and postgrad work with Hauerwas…). He has also written more than once that the holiest person he has ever known was his Baptist father-in-law. What were they using to preach that Jesus was the Messiah? The Septuagint, because that was the Bible of the people. The Jews in the diaspora did not know Hebrew. So they preached and they gained a few converts. They created a separate community of Jewish Christians, Jews who believed that Jesus was the Messiah. It’s as if ignorance of the Hebrew Bible is how one must account for “Jews who believed that Jesus was the Messiah.” And what follows is the suggestion that the MT is some cause against Christianity. But, as you note, these subtle binaries (of believers vs. non-converts; of the LXX as the true reflection of the Hebrew vs. the MT as substantially corrupt) do not square with what – as you put it – “Any good Orthodox translator would definitely” do. Even so, on the basis of this version of history, putting forth the Septuagint as the prototypical and ideal authority (even if all of the texts are to be “interpreted through the lens of the Cross and Resurrection of Christ”) seems a stretch to me. You know my own Southern Baptist background and may even know that both my own father and my father in law have been ministers in this denomination; so you do get me interesting in Stephen Freeman’s conversions. I see what you mean. I don’t believe Constantinou meant that ignorance of the HB is what accounts for Jews believing in Jesus as the Messiah. Again, she was speaking to a very general audience, likely to quite a few with Protestant backgrounds, who are very familiar with the MT in English but know nearly nothing about the LXX, and bring a Protestant understanding of what the bible is for – which is not the same understanding as in Orthodoxy. I think if you were to converse with her she would be able to meet you at your level on this. I know she has great respect for Jewish learning, present and past. I visited the church she and her husband were planting a couple of years ago, and met a retired Jewish professor of Classical Greek who lived in the next town and would come to the Liturgy from time to time simply to be able to hear the Greek he loved, (It was about the only place he could hear it in western Riverside County… horse country!) Everyone knew he was not interested in converting, and nobody was trying to “evangelize” him. I was sitting at the table with them, and he and Jeannie had a very interesting and technical discussion, as old friends. Your personal story here is fascinating. My own experience is that ancient Greek that is classical and ancient Greek that is rhetorical and ancient Greek that is philosophical and ancient Greek that is scientific and ancient Greek that is Koine and ancient Greek that is various religious / biblical are often researched, studied, taught, appropriated, and applied by individual groups in isolation of one another. Or when, say, a rhetoric scholar gets adventurous enough to see what a religion scholar (or more rarely a practitioner of religion) is doing with the old Greek, then the learning tends to go in just one direction. Did Jeannie and her husband ever venture over to that next town to hear professors of Classical Greek? More of this cross-discipline study and appreciation of the language(s) can only benefit all, I believe.